Chez Geek is back! This supplement – illustrated, of course, by John Kovalic – includes 56 more cards. More people, more crummy jobs, more pets, more food, weed, and nookie! Special bonus: The box is oversized, to hold ALL your Chez Geek cards. The outside of the box shows the Chez Geek apartment building . . . take the lid off, and the inner box shows what's happening INSIDE . . . Looking to design your own Slack? Need to replace that worn-out Nookie card? 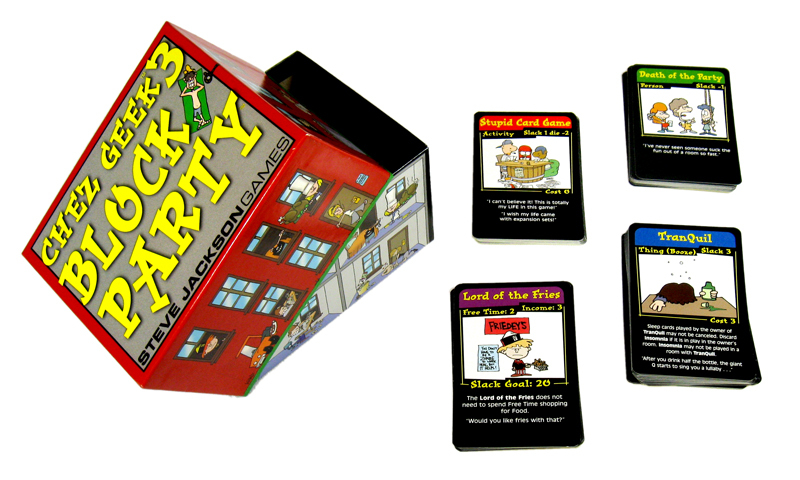 Try Chez Geek Blank Cards! The Munchkin Level Counter includes a Chez Geek counter! The Chez Geek FAQ. NOTE! If you are using the new rules with the old cards, you'll need to read the FAQ file as well, or you'll never be able to get a new job when you lose your old one . . .
Chez Geek wallpaper, in 800x600, 1024x768, and 1600x1200 resolutions! 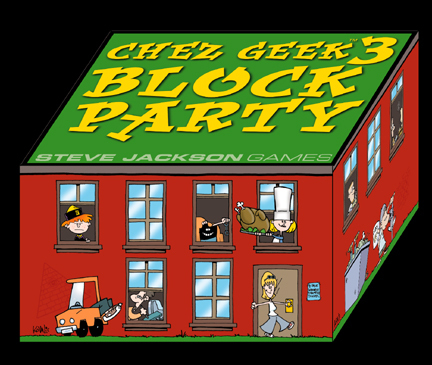 Errata for Chez Geek 3: Block Party.